Forgot to include this post along with the others, but if you're not sick and tired yet of LEGO's Collectible Minifigure line, Series 11 is now available. They have thankfully upped the purchase limit from 16 to 32, so you're chances of getting 6 of one minifigure is even greater. Price is $2.99 a pop. Oh, and if you were having troubles getting the Clone Trooper Lieutenant to automagically add to your cart when at least $50 of LEGO Star Wars product was added, that has been fixed now. I think this is the most interesting minifig line in awhile. I want most of these, whereas the last several sets have had 2-3 I cared enough to get. and if the Pretzel Girl is the St. Pauly Girl, for sure, the Most Interesting Man in the World's gotta me coming in some form. You know, if LEGO would just make a Bug Exterminator mini-fig in a tan jumpsuit with a name patch, we could all make our Ghostbusters sets more easily, just by adding a backpack and a wand. 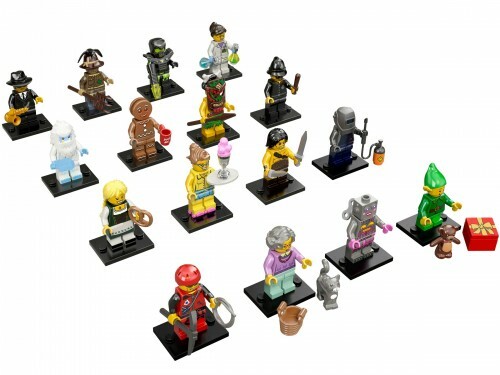 Does anyone know if series 11 comes with codes for their new Lego minifigure MMO yet? Will we have to wait for series 12-13 for those? I need me that Yeti and Welder. plebeianprint wrote: Does anyone know if series 11 comes with codes for their new Lego minifigure MMO yet? Will we have to wait for series 12-13 for those? I picked up two at a Walmart and there doesn't appear to be anything re the MMO anywhere that I can see. Solo wrote: I need me that Yeti and Welder. Yeti was my most wanted out of the series and I'm glad I got him. I'm only interested in 4 others: Tiki, Elf, Gingerbread and Scarecrow and will take my time feeling out the packs for them. Maybe the batch I was looking at was picked over, but but the ratios of the figures seemed really, really unbalanced. That being said, really awesome set. Best Agricultural Minifigure (ever? ): The Scarecrow. So many little details. Superbly done. Just picked up the Tiki Warrior, took about 10 minutes of feeling because I had no idea the plastic head piece was SOFT plastic and not hard plastic. Also, there's a bone piece in there that goes with his hair. The only way I knew it was him was because of the spear. Yeah, I really wish Lego would even out the ratio, or at least make more of the figure that are in greater demand. I was one of the idiots hanging out at the Lego store feeling these things. A t least a couple people looked only interested in the rarer figures for resale purposes, and that sort of thing really bothers me. Not to mention it takes me way longer to get a full set, because the figures that were rare to begin with are now even harder to find. The tiki warrior through me as well, mostly because I didn't realize he had the hair piece and bone. After feeling the package for a minute I just said #@[email protected]#4 it and opened it. Overall though I think the nice thing is that this series has at least 3 or 4 figures most people have had on their want list for a while. I'm still waiting for an Egyptian Cat goddess to go with my Anubis figure, but I have a feeling I'll be waiting a while for that one. Best accessory defiantly goes to the Yeti's ice pop. Brilliant. I know the box I went through had been picked over already, but I was rather surprised that the first FOUR packages I felt were all Yeti. And I found another two later on. That's a lot of Yeti. I only bought one, though. Picked up all of Series 11 today at my local Target. I thought I had made a clean sweep 16 for 16 but on the last bag I opened I had a duplicate Welder instead of the British Bobby cop. Not sure how they happened. Thankfully I had stashed aside an extra Bobby in case I wanted two so I was able to go back and grab it and complete my set.